A diverse group of Puget Sound women present the culmination of ten-month intensive dance training program ANAR DANA alongside solo performances by soloist, teacher and acclaimed dance ethnologist Helene Eriksen. Sales at the door (cash and check only) are $20 ($15 for youth 12 and under). For those who want to support the ANAR DANA project. We have a special donor ticket online that comes with preferential seating, a copy of the 2014 ANAR DANA DVD and a special thank you on our facebook page! Dance ethnologist Helene Eriksen began her teaching career researching and performing dances of the Balkans and celebrated her 30th teaching anniversary in 2009. Throughout her career, Helene has studied a multitude of traditional dance forms, from Morocco to India, including various peoples of Turkey, the Balkans, and the Caucasus Mountains, Central Asia, the Middle East and North Africa. This summer event marks the culmination of the 7th Seattle training program and shares the rich cultures of the Orient through music, costume, dance, and informational presentations by program participants. Currently there are ANAR DANA programs in Seattle, San Francisco, Berlin and Bavaria. 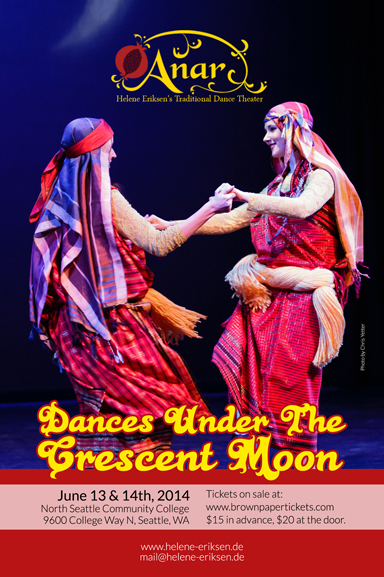 ANAR DANA: Helene Eriksen's Traditional Dance Theatre presents women's dance and culture from the regions of North Africa, the Middle East and Central Asia. ANAR means pomegranate and DANA seed; the name symbolizes the crystalline beauty of collective traditions...where each kernel is unique and luminous, yet together they form a fruit that is celebrated in the Middle East as a symbol of beauty, fertility and culture. The ancient traditions of these predominately Muslim societies are largely unknown in the West and are disappearing quickly in our globalizing world. Our view of the cultures of the Muslim world are skewed by clichés, deep seated fears and current wars. ANAR DANA brings these breathtaking and inspiring traditions into a new focus for a wider audience through professional dance concerts with spectacular music and costumes. Every year in September a new group of women begin on the ten-month long journey that is ANAR DANA: meeting once a month for an intensive twelve-hour weekend workshop. This year's repertoire includes dances from the Chleuh Berbers of Southern Morocco, Dabke from Palestine, a Sedjanka from Bulgarian Thrace, Roman dances from Turkey, dances from Turkish village of Şavşat on the border to Georgia, Persian dance set to mystical 19th century poetry and dramatic dances from the courts of Bokhara in Uzbekistan. We have 3 choreography premieres with 3 new sets of costumes. We have incredible vintage costumes from Bulgaria, Palestine and Uzbekistan. In addition, Helene Eriksen, internationally renowned dancer, scholar and choreographer will join the project ensemble on stage with evocative solo dances from Armenia, Egypt, Turkmenistan and the Gagauz (Turkic speaking Orthodox Christians) of Bulgaria. We would really love it for you to come out and give us your support! Want to support ANAR DANA in what we do? Please make a donation by buying a donor ticket or additional tickets even if you can't use them all!